The generosity of accounting firm Bishop Fleming is adding up to a lifesaving boost for Cornwall Air Ambulance. The Truro-based business has become the first company to sponsor a Cornwall Air Ambulance crew member’s uniform after it donated £2,000 to the lifesaving charity. Critical Care Paramedic Thomas Hennessy Jones proudly sports a Bishop Fleming logo on his left shoulder when he carries out missions across Cornwall and the Isles of Scilly. The charity is now looking for more businesses to sponsor the remaining six helicopter crew members. Bishop Fleming has also adopted Cornwall Air Ambulance as its charity of the year. Staff are planning a variety of fundraising activities and they have already hosted a successful sports quiz. A member of Bishop Fleming staff has also signed up for the Cornwall Air Ambulance UK Three Peaks challenge this summer. Alison Oliver, a Partner at Bishop Fleming, said: “As a leading Cornwall-based business committed to the region, we know only too well the importance of keeping Cornwall Air Ambulance in the sky. As a charity, Cornwall Air Ambulance does not receive any government funding towards its running costs and instead relies on donations to keep flying and saving lives. Its crew carry out more than 800 missions each year to people in desperate need of medical care. 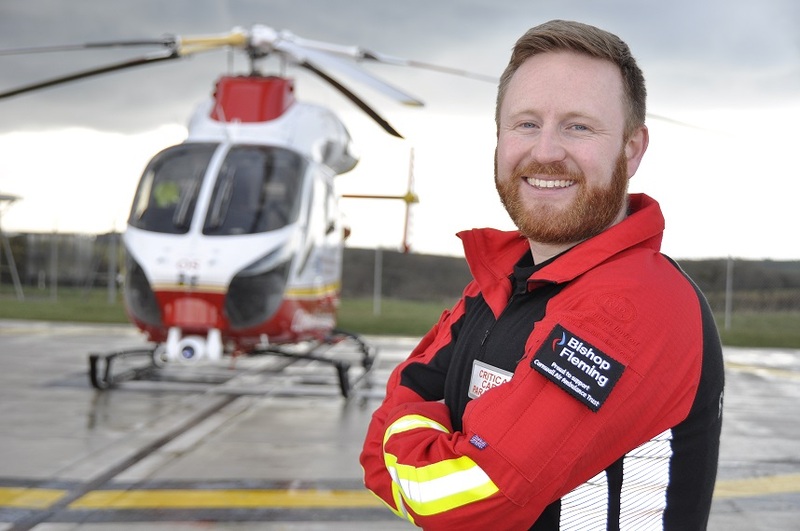 Critical Care Paramedic Thomas said: “I’m proud to wear Bishop Fleming’s logo on my uniform because support like this pays for myself and the rest of the crew to keep flying and saving lives. We are incredibly grateful, thank you. Businesses in Cornwall play a huge role in ensuring the air ambulance can continue to fly and save lives. Those that do support the charity find it a hugely rewarding and beneficial experience. Steph Preston-Evans, Corporate Fundraising Officer at Cornwall Air Ambulance, said: “Bishop Fleming is a fantastic example of a business stepping up and doing something positive for the communities it serves. We’re proud to have them on-board and I know staff are already enjoying the morale-boosting benefits of coming together to help raise money for Cornwall Air Ambulance. “We’d love to see other businesses come forward and sponsor members of the aircrew, or even have their company logo on the Cornwall Air Ambulance itself, alongside our current helicopter sponsor Ann’s Cottage. Alternatively, contact Steph Preston-Evans on 01637 889926 ext 125, or email steph@cornwallairambulancetrust.org.